Last week was a bit jumbled, but we managed to check off quite a few activities on our list. As gardening and summer draws near, we are getting busier and busier and, once the weather finally turns, most of our fun will be outside. The word family slam game we did (with numbers instead of words) was fun for about 5 minutes. After that, all interest was lost and instead, the boys just took turns throwing the nerf ball, as hard as they could, at the wall, and then each other. At least they took turns I guess. This week we are going to try monster counting. Joe is still really into monsters so I think he will like it. 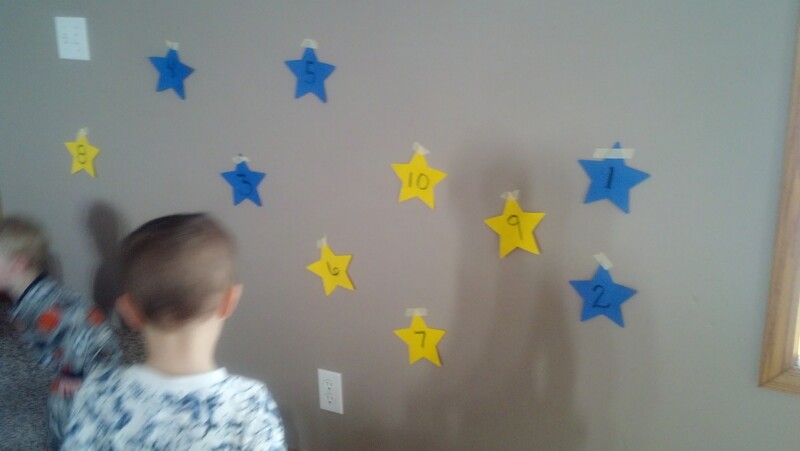 He’s been really surprising me lately with his mad counting skills. The other day he counted to 17, completely unprompted. Usually, he counts to 3 and then starts skipping around–14, 19, 17, 419. It made me wonder what had finally clicked for him. We tried to trace letters in the sand, but it was not loose enough so we ended up just hiding the foam letters in it and digging them out. Joe had a ton of fun with it. Jake got to dig in flour. I tried to let him play with the sand but the second thing he did was put a chunk of it in his mouth. Flour it is. Joe likes to tell stories. He likes to make up tales of dragons and witches and fish. He likes to yell, “We have an emergency” while running around the living room and he likes to carry around a little drawstring bag and call himself the “Shape Bandit.” So when I found a storytelling activity on Kid’s Activities Blog using Legos I thought…perfect. We did not do the coffee filter flowers last week, which is probably why it snowed again. We are going to do them this week instead as a reminder to Spring to hurry along. 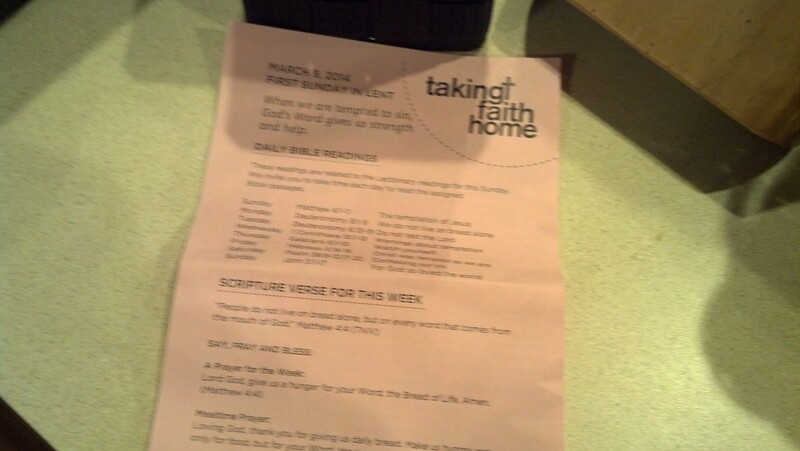 Each Sunday at church there is a little take-home slip in the bulletin called “Taking Faith Home”. I see it every week and it was only this week that the light bulb turned on. This is what our weekly bible study can be based on! There are mealtime, bedtime and anytime prayers and daily readings. Exactly what we need!